Original Editors - Ed Foring as part of Bellarmine University's Pathophysiology of Complex Patient Problems project. Top Contributors - Edward Foring, Kaylynn Schwamb, Michael Helton, Elaine Lonnemann and Simone Potts Read more. McArdle’s Disease, also referred to as Myophosphorylase Deficiency, or Type V Glycogen Storage Disease, was first described in 1951 by Dr. Brian McArdle while he was practicing in London, England. The condition is a recessive inherited disorder that presents as an inability to metabolize glycogen, the storage form of glucose. This results in a variety of symptoms affecting the musculoskeletal and urinary systems. Patients afflicted by McArdle’s Disease most commonly suffer from muscle fatigue. 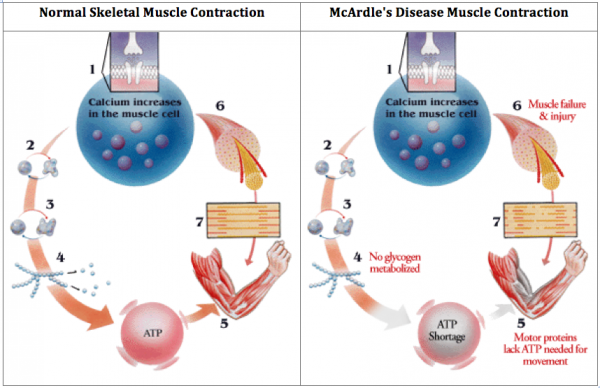 Refer to the model below to see how muscle contraction differs in an unaffected muscle compared to one with McArdle’s Disease. McArdle's Disease is rare and affects approximately 1 in 100,000 people. However, it is one of the most common disorders affecting muscle metabolism. The disease presents more often in men than women. It is believed that many people remain undiagnosed. It presents in the second to third decade of life with symptoms reported at childhood. The earliest and most common signs and symptoms of McArdle’s Disease are exercise intolerance and fatigability. Other signs and symptoms may include myalgia, muscle contractures, stiffness, cramping, rhabdomyolysis, myoglobinuria, and second wind. Symptoms typically present 10 seconds after beginning strenuous exercise. This is when skeletal muscle relies on the conversion of glycogen to glucose to produce ATP, the main energy source for muscular contraction. The inability of the skeletal muscles to metabolize glycogen into glucose with strenuous activity leads to an abrupt feeling of exhaustion or fatigue and an increase in heart rate. This is known as premature exhaustion. Individuals may complain of difficulty with any moderate activity including walking, jogging, or ascending and descending steps. Muscle failure occurs under extreme stress when the muscle no longer can produce contraction regardless of the effort made. Muscle failure leads to cramping (electrically silent contractions), which is very painful and can lead to muscle damage. The body begins to break down muscle to provide the cells with a tertiary energy source in the form of protein. This process, referred to as rhabdomyolysis, releases creatine kinase and myoglobin into the blood, and excretes those proteins with urination. Myoglobinuria is the symptom that refers to the reddish coloration of urine due to the high protein concentration, ultimately leading to kidney dysfunction and failure. Muscle damage caused by rhabdomyolysis can lead to fixed weakness, or persistent muscle weakness, that makes it extremely difficult to make strength gains. “Second Wind” is the phenomenon that has been observed in patients with McArdle’s Disease, in which the metabolic pathway switches from glycolytic to oxidative phosphorylation. After 10 seconds, all of the readily available glucose in the system is depleted and the patient begins to fatigue. From 10 seconds to about 8 minutes of exercise, the patient will experience moderate to severe pain from the muscles breaking down in order to compensate for the inability to break down glycogen. After 8-10 minutes, the second wind will kick in and the patient should be able to continue exercising for 45 minutes without pain and with an appropriate heart rate response, depending on their level of physical fitness. Second wind can be monitored through a patient’s heart rate. After reaching an inappropriate peak, the heart rate will lower and level off, signifying the start of the second wind. Second wind is not a systemic effect, and must be achieved in each muscle group independently. This does not relieve muscle failure symptoms for intense exercise, but offers some relief for light to moderate exercise. Renal Failure: Kidney dysfunction and failure are associated with rhadbomyolysis and myoglobinuria. Gout: Inhibited ATP production leads to the production or purine metabolites. These metabolites are converted to uric acid, which can lead to hyperuricemia. 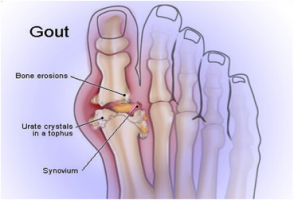 The most common place for gout to form is the first metatarsal; however it can be found in the insteps, ankles, heels, knees, wrist, fingers, and elbows as well. There are currently no medications used to treat McArdle's Disease. 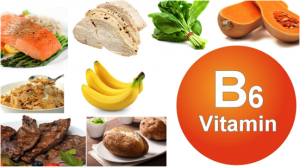 Vitamin B6 (mixed evidence): Izume et al. found decreased fatigue and increased glycogenolysis as seen on the ischemic forearm test with B6 supplementation. Beynon et al. found no significant improvements compared to a placebo treatment. However, approximately 80% of vitamin B6 binds to myophyphoralyse, so patients with McArdle’s Disease may need to supplement B6 to avoid deficiency. Creatine supplements: Vorgerd et al. found an increase in exercise tolerance of workload and depletion in phosphocreatine with low levels of creatine supplementation, but an increase in symptoms with high levels of creatine supplementation. Oral Sucrose: Vissing et al. concluded that oral ingestion of sucrose can significantly improve exercise tolerance in McArdle’s Disease. However, overtime this supplementation may cause weight gain and is contraindicated for any individual with diabetes. There is a lack of evidence to show benefit from supplementation with branched chain amino acids, depot glucagon, dantrolene sodium, verapamil or, high-dose oral ribose. Anderson et al. found that this diet, compared to a protein rich diet (55% protein, 30% carbohydrate and 15% fat), resulted in a significant drop in heart rate and work effort with a 25% increase in maximal oxygen uptake. A low carbohydrate diet is not recommended because it will deplete liver glycogen and reduce the amount of glucose released into the blood stream. This will lead to hypoglycemia (low blood sugar) when the person becomes active. It is recommended to consume a sugary drink or snack before participating in strenuous activity to provide the body with immediate energy before the second wind is achieved. When lab work is conducted on a patient with McArdle’s Disease, creatine phosphokinase (CPK) will be elevated; however, this value alone does not indicate that the individual has McArdle's Disease. CPK values will be elevated due to muscle breakdown in the system because the enzyme is released into the blood stream any time the brain, heart, or skeletal muscle undergoes significant damage. The test is performed by contracting the forearm to fatigue with a blood pressure cuff inflated to greater than systolic pressure. Antecubital blood samples for lactate and ammonia are collected before and following exercise at 0, 1, 2, 5, and 10 minutes. Ischemia blocks oxidative phosphorylation and ensures dependence on anaerobic glycogenolysis. Lactate levels normally rises at least fourfold within 1 to 2 minutes of exercise and ammonia rises fivefold within 2 to 3 minutes. Lactate concentration will rise several-fold under ischemic conditions in normal subjects. There will be no or minimal rise in patients with McArdle’s Disease. The ischemic forearm test is uncomfortable to undergo, and may take hours to get blood samples at a resting metabolic rate. This test may produce false negative or false positive results, and has now been replaced by the non-ischemic forearm test. This test is done in the same manner as the ischemic forearm test but without the blood pressure cuff. Kazemi-Esfarjani et al. described one method of this test below. Kazemi-Esfarjani et al. recommend that the aerobic forearm test at 100% MVC should be used as the routine diagnostic test for patients with suspected disorders of muscle carbohydrate metabolism. The test is similar to the Ischemic Forearm Test, except that cuff inflation is not used. This test uses maximal handgrip exercise averages so that work intensity does not have to be monitored as closely. The study showed that the aerobic 100% MVC test provides the highest sensitivity and specificity for glycolytic disorders of muscle metabolism and is best tolerated. d can confirm diagnosis of McArdle’s Disease. McArdle’s Disease has been shown to have an autosomal recessive inheritance pattern, requiring two defective copies of the gene for the condition to manifest. The defect exists as mutation of the gene for myophosphorylase (PYGM), which occurs on chromosome 11. 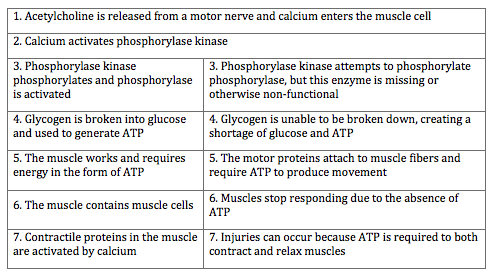 Myophosphorylase is an enzyme that helps break down glycogen into glucose during exercise. Carriers of the gene are not known to have symptoms of the disease. There are three basic energy systems. This system is an anaerobic mechanism that occurs in the sarcoplasm of a muscle cell which provides ATP for short term, high intensity activities. The Phosphagen System is active at the start of all exercise, regardless of intensity. It relies on hydrolysis of ATP and breakdown of creatine phosphate (CP) which supplies a phosphate group to ADP to replenish ATP. CP is only stored in small amounts, so it cannot sustain continuous, long duration activity. This system is intact in patients with McArdle’s Disease. Glycolysis utilizes either glycogen stored in the muscle or glucose delivered in the blood to resynthesize ATP production during glycolysis. This system is not as fast as the phosphagen system, but the output is much higher due to the stores of glycogen and glucose. This system is not intact in patients with McArdle’s Disease because glycogen is not readily available to break down. The end product of glycolysis is pyruvate. Pyruvate can then be converted to lactate, or be shuttled into the mitochondria. Pyruvate is converted into lactate. ATP production is rapid, but short in duration. This energy system is typically trained in sprinters or resistance trainers. Pyruvate is shuttled into the mitochondria, converted to Acetyl CoA, and entered into the Krebs Cycle. ATP re-synthesis is slow, but can occur for a long duration if the exercise intensity is low. This energy system is typically trained in long distance runners or other athletes engaging in aerobic activity. This is the process of adding an inorganic phosphate to another molecule. The re-synthesis of ATP in the electron transport chain (ETC). 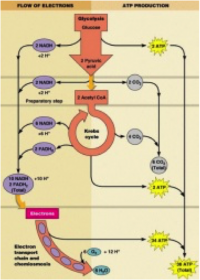 NADH and FADH2 are byproducts of fatty acids and amino acids converting to pyruvate, acetyl CoA, oxaloaceate, succinyl- CoA, and ketoglutarate in order to enter the Krebs Cycle. NADH and FADH2 are used to re-phosphorylate ADP to ATP by providing a hydrogen ion. The Hydrogen ion is necessary to phosphoraylize the ADP. This is where the "second wind" that McArdle's patients experience is derived from. The aerobic system is the primary source of ATP at rest and during low-intensity activities. This system uses primarily carbohydrates and fats as substrates, but proteins will be metabolized during long-term starvation and long bouts of exercise. Since carbohydrate metabolism cannot occur in McArdle's patients, they primarily function with blood glucose metabolism, fat metabolism, and ultimately protein metabolism which can result in rhabdomyolysis. At rest, 70% of ATP production comes from fats and 30% from carbohydrates, while high intensity aerobic activity utilizes almost 100% carbohydrates. In prolonged sub-maximal, steady state work, there is a gradual shift from the use of carbohydrates to fats and proteins for energy. Oxidative metabolism of blood glucose and muscle glycogen begins with glycolysis. Pyruvate, the end product of glycolysis, is then converted to Acetyl-CoA and enters the Krebs cycle. Oxidation of the substrate-level phosphorylation yields ATP. Byproducts NADH and FADH2 enter the electron transport train. The total yield of this process is 38 ATP. Triglycerides stored in fats can be broken down by hormone sensitive lipase. This releases fatty acids from the fat cells into the blood, where they can circulate and enter the muscles. Fatty acids enter the mitochondria where they undergo beta oxidation, breaking down the fatty acids into acetyl-CoA and hydrogen protons. Acetyl-CoA enters the Krebs Cycle and hydrogen atoms attach to NADH and FADH2 and enter the electron transport chain. The total yield is 463 ATP. Proteins can be broken down into amino acids by various metabolic processes. These amino acids can be converted to glucose, pyruvate, and various Krebs Cycle intermediates. The major amino acids believed to be oxidized in skeletal muscle are Branches Chained Amino Acids, which are leucine, isoleucine, and valine. The waste products of amino acid degradation are urea and small amounts of ammonia. This can lead to hyperuricemia in McArdle's patients resulting in gout. Urea and ammonia are also toxic to skeletal muscle, and can contribute to fatigue. There have not been any studies that have found long-term effects on the general health on individuals with McArdle's Disease. Typically, individuals with this disease are in excellent health as long as the disease is managed properly. If the disease is unmanaged, it can lead to cases of rhabdomyolysis, kidney failure, and liver dysfunction. Precaution: Any patient with McArdle's Disease who has cardiovascular complications could be on a statin medication. Statins increase the potential risk for rhabdomyolysis. In this case, physical activity should be keep to an absolute minimum. In general, no specific treatment exists for McArdle's Disease. In some cases, diet therapy is helpful. Meticulous adherence to a dietary regimen may reduce liver size, prevent hypoglycemia, allow for reduction in symptoms, and allow for growth and development. Some findings suggest that corrective gene therapy or enzyme replacement for McArdle's Disease may be possible in humans in the future. Interest in glucagon treatment for McArdle's disease has developed, but studies have shown no benefit over a placebo treatment. The physical therapist has an important role in keeping the patient active and avoiding inactivity due to fatigue. 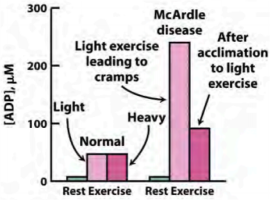 Optimal exercise programs for managing McArdle’s Disease are aerobic based; they provide light resistance along with a cardiovascular component. A plan of care incorporating low to moderate intensity aerobic physical activity can improve symptoms and reduce susceptibility to injury of the muscle. The goal is to achieve the "second wind" for each muscle group that is being worked. Light to moderate resistance training can also help, but allow adequate time to rest in between sets. As a rule, do not work the muscles to absolute fatigue, and be sure to target larger muscle groups. If strenuous activity must be done, use a 6 second rule. Only do that activity for 6 seconds prior to resting to ensure that only the phosphagen energy system is used in anaerobic activity. Physical therapists can promote flexibility in order to prevent muscle contractures and reduce pain. Stretching should be very light because maximal stretching will work the muscle anaerobically by inducing a protective contraction from the Golgi tendon. This strong protective contraction can lead to muscle damage. Stretching following walking may offer immediate and dramatic pain relief to individuals with McArdle’s Disease. For active individuals, stretching should take place very frequently to help reduce cramping. If not, muscles may become tight due to the toxic build up throughout activity and stretching can become painful. Physical therapists should encourage a stretch that feels sufficient without causing pain. Physical therapists should promote active participation by patients in managing their disease. Individuals with McArdle’s Disease can easily overexert themselves and become injured without even realizing it. It is important that they be conscious of their energy levels, blood sugar, heart rate, and general well-being. These individuals have a place in physical therapy to improve aerobic capacity, strength, and flexibility. 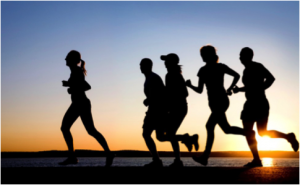 During any low to moderate intensity activities, patients with McArdle’s Disease should warm up properly until they achieve the "second wind." Strenuous activities should be limited to six seconds to ensure the use of the phosphagen system. For a brief discussion of treating a patient with McArdle's Disease, refer to the video below. Individuals with McArdle’s Disease claim that massage therapy can be beneficial in maintaining an active lifestyle. Any massage should be light and fluid using effleurage techniques. Deep and hard massage for trigger point or myofascial release can be damaging to the muscle and should be avoided. Massages help push fatigue causing toxins out of the muscles and into the blood stream where they can be excreted from the body. It is recommended that individuals with McArdle’s Disease take in plenty of fluids following a massage to help flush the body of toxins. Pain with massage is a sign that rhabdomyolysis may be occurring. Do not continue massage therapy with pain. Rhabdomyolysis: a clinical and biochemical syndrome resulting from skeletal muscle injury that alters the integrity of the muscle cell membrane sufficiently to allow the release of the muscle cell content into the plasma. Due to the quick breakdown of the skeletal muscle there is a big accumulation of the breakdown products which can cause renal failure. Although rhabdomyolysis is a symptom of McArdle’s disease, it can be a symptom of other conditions, or it can exist independently. Fibromyalgia: a syndrome characterized by widespread chronic unabated pain in addition to a host of several additional co-morbidities that can severely impact and disrupt a person’s daily life. The symptoms associated with fibromyalgia may originate from abnormal central nervous system output. Fibromyalgia isn't just one condition; it's a complex syndrome involving many different factors. McArdle’s Disease and Fibromyalgia share many symptoms, but they have different causes, so their treatments differ. Muscular Dystrophy: a group of more than 30 inherited diseases. They all cause muscle weakness and muscle loss. Some forms of MD appear in infancy or childhood. Others may not appear until middle age or later. The different types can vary in whom they affect, which muscles they affect, and what the symptoms are. All forms of MD grow worse as the person's muscles get weaker. Most people with MD eventually lose the ability to walk. McArdle’s Disease and Muscular Dystrophy share many symptoms, such as weakness and muscles loss. Myositis: Myositis means inflammation of the muscles that you use to move your body. An injury, infection, or autoimmune disease can cause it. Two specific kinds are polymyositis and dermatomyositis. Polymyositis causes muscle weakness, usually in the muscles closest to the trunk of your body. Dermatomyositis causes muscle weakness, plus a skin rash. 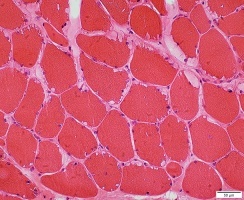 Because Myositis also causes muscle weakness, it can present similarly to McArdle’s Disease. Tarui's Disease: A condition in which there exists a deficiency of the phosphofructokinase enzyme, which is needed to facilitate the breakdown of glucose into energy in muscle during exercise. Tarui’s Disease is also a glycogen storage deficiency, so it has many similarities to McArdle’s Disease. Consequently, they are treated in a similar manner. Special thank you to Andrew Wakelin, McArdle’s Disease (GSD Type V) Coordinator for AGSD UK for review and insight towards this page. ↑ 3.0 3.1 3.2 Baechle Thomas R and Roger W Earle. Essentials of Strength Training and Conditioning. Human Kinetics. Champaign,IL 2008. ↑ 6.0 6.1 Izumi R, Suzuki N, Kato K, Warita H, Tateyama M, Nakashima I et al. A Case of McArdle Disease: Efficacy of Vitamin B6 on Fatigability and Impaired Glycogenolysis. Internal Medicine. 2010;49(15):1623-1625. ↑ 11.0 11.1 Quinlivan R, Martinuzzi A, Schoser B. Pharmacological and nutritional treatment for McArdle disease (Glycogen Storage Disease type V). 2017.